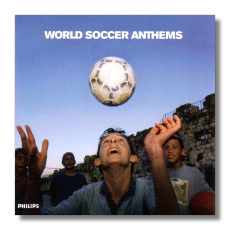 As the World Cup approaches, you would have singularly bet that the record companies are going to cash in on the spectacle. This time we have the charismatic, dapper Seiji Ozawa who has already directed the VPO in the New Year's Concert to substantial critical acclaim. Here he conducts twenty three different national anthems in their full blown symphonic arrangements. There are some stirring tunes here, particularly the evergreen 'Marseiallaise', the German anthem and a host of unfamiliar elements from Korea, Denmark, Turkey and the stirring Croatian anthem. You cannot really go wrong with such vivid interpretations and with patriotic fervour at its peak; I'm sure most of you out there will enjoy these tunes to the hilt. The couplings are a hotchpotch assembly of famous operatic pieces with Bernstein's 'The Great Escape' making a welcome appearance. The overplayed 'Nessun Dorma' makes yet another appearance and I doubt if you don't have that already. Finally there is the noble 'Zadok the Priest', evidence of an English triumph perhaps? Dream on folks!